Map: Parise, Mike. The Surfer’s Guide to Baja. 2004. SurfPress Publishing. The unique surf at Scorpion Bay is attributed to the way the points face extremely to the southeast. This allows for steady offshore winds to perfectly shape the waves and generate the famous rides that can last over a minute long. Scorpion Bay faces southeast so it only picks up south swells which, generally speaking, occur between March and November and more frequently during the summer and hurricane months. As winter is now upon us, south swells become less frequent as west and northwest swells dominate to leave Scorpion Bay with small, meager surf for the next few months, however a quick drive north or south of town will help you discover the numerous breaks nearby that will come to life from the west and northwest swells and will allow you to surf all year long during your stay at the Scorpion Bay Hotel. Here is a quick guide to some of these spots. Scorpion Bay consists of eight point breaks in total but it is the first four that it is most famous for. Once you get to 4th point (pictured left), the angle of the point shifts and allows for lefts to break, not the traditional rights Scorpion Bay is known for, even on south swells. Scorpion Bay Hotel employee, Derek Benson, finds some lefts all to himself at 4th point during a south swell. Continuing north to 5th point and beyond, only about 20 minutes away from the Scorpion Bay Hotel, the points start to face westerly and begin to pick up the northwest swells and the rights start to give way to lefts and fun connecting sections. The beaches from 5th point and beyond are all private and secluded beaches where surfers can enjoy that may entice you to take a quick dip in the water, surf the unnamed waves, or just take a beach day away from other surfers at the first four points. The surf here is not as consistent as the other points, as these points are further exposed and receive onshore wind during the day. Beyond the eight points of Scorpion, the empty beaches here face more west. From there, you have about four miles of beach breaks that lead up to Boca Cadaje/La Lagoona. This area offers lefts and rights on both sides of the lagoon that break on west and northwest swells. Further north is Punta Santo Domingo and The Finger. This point is well off the beaten path and most of this area has high, impassable cliffs. Although just north of these cliffs there is beach access at The Finger. This beach break offers lefts and rights that will break on west and northwest swells. This spot is very isolated and takes three hours to get to. Another option is to head south from the Hotel, where within a couple miles the beach faces more west. 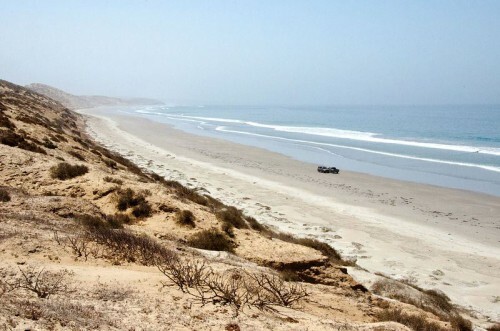 Take the beach route or follow the south road out of San Juanico and you will have access to miles of beach breaks and river mouths that break on west and northwest swells. 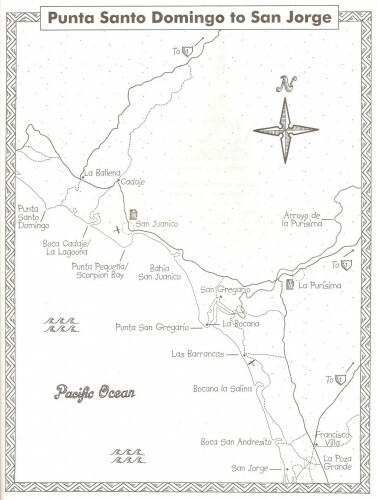 Further south leads to Punta San Gregorio, a mix of fickle reef breaks, beach breaks and a large river mouth that will break on west swells. The last area of surf within reach is Las Barrancas, a two hour drive south from the Scorpion Bay Hotel. Here you can find reef breaks that offer lefts and rights that will break on west and northwest swells. If the four points at Scorpion Bay don’t have the right swell direction when you are staying at the Scorpion Bay Hotel, there are plenty of other options that will pick up the right swell direction just a quick drive north or south. If you want a little help finding these spots, a guide can be arranged for you at the Hotel to put you onto the surf. Discover Baja members receive a 15% discount at Scorpion Bay Hotel.